In a few short weeks Mountain Brook’s Little Garden Club, a charter member of the Garden Club of America, will host a regional zone meeting and flower show. It will take place April, 2014, and a lot of folks are involved in planning this important event. Members of GCA clubs will be attending from the surrounding states, so there will be a lot of visitors! I’ll be assisting with a number of others in the “passing” of the horticultural exhibits – clearing them for entry into the flower show to be judged. I was very flattered to be asked and happy to help with this event, which has been two years in the planning. What does all this have to do with miniature gardens, you ask? 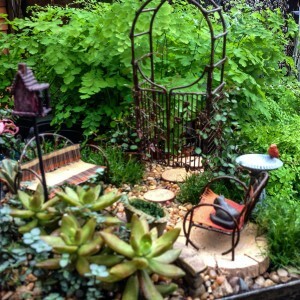 Well, these tiny gardens have been very popular the past number of years, and the garden club organizers decided it would be a fun thing to have on some of the tables for one of their meetings. And they turned to Oak Street Garden Shop for help. The containers we chose are metal, and they will be wrapped with aspidistra leaves to make a “Ribbon of Green”, the theme of this year’s meeting. These pictures show how some turned out. The miniature gardens are designed to continue living as a true garden, so plant material is chosen accordingly, with only minor exceptions. 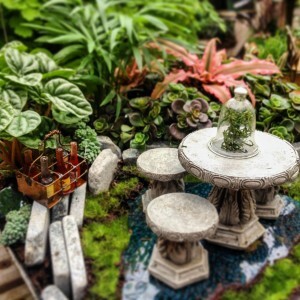 Because these take a great deal of time to make, I finally gave up on waiting for new miniature garden accessories I’d ordered since my deadline to have them completed was looming…but I still had plenty of fun things to play with. 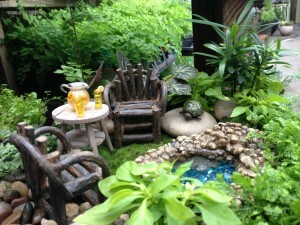 If you’ve ever made one of these gardens in miniature, you’re well aware how detailed and time consuming they are. 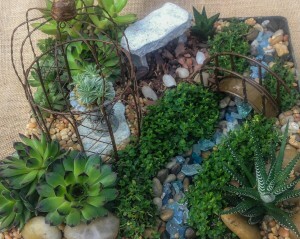 For some of the centerpieces I chose succulents, including haworthias and sedums, which work well for tiny plantings. Pilea ‘Aquamarine’ is a low grower with a great color; it just needs clipping regularly to keep it from overrunning its neighbors. 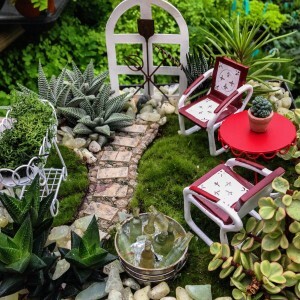 Tiny pots of ordinary houseplants also work in these gardens. Little parlor palms, ferns, polka dot plants and baby podocarpus make good companions, and selaginella is a pretty groundcover. It’s nice to have different sizes of pebbles to create paths and larger stones to create “boulders”. Can you see the turtle sitting on one? There’s still more tweaking to do (Just like a real garden that is never “done”! ), and one more not even started yet…but that story is for another post. If you’re in the Birmingham area, stop in and take a look. They’re even more fun in person! 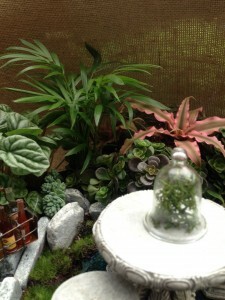 This entry was posted in Arrangements, Container, Ferns, Indoor Plants, Miniature Gardens, Project, Succulents and tagged arrangements, containers, ferns, hobby, miniature garden accessories, miniature garden centerpieces, succulents in miniature gardens on March 19, 2014 by Kris Blevons.